Israel has been experimenting its weapons it uses for killing Palestinians by first selling them to the Burmese military to massacre the Rohingyas. 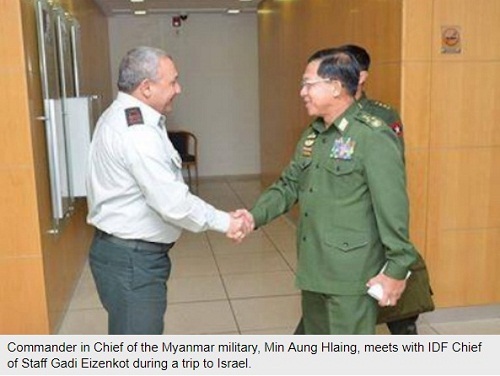 One of Israel's largest weapons companies, TAR Ideal Concepts, confirmed that Israel is arming and training Burmese forces who are presently slaughtering minority Rohingya Muslims daily in the Rakhine province of Burma. Israel hasn't stopped supplying arms to the Burmese military despite the rapidly worsening human rights situation in Burma; Israel refers to this policy as "diplomacy." The image above is of September 2015, that is, more than 3 years after the ethnic cleansing began in Burma. One can be absolutely sure of the bloodletting agenda of this meeting. Israel's goal is to ethnically cleanse Palestine of the indigenous Palestinian majority while Burma's goal is to ethnically cleanse the land of the indigenous minority Rohingya. This murderous and racist stratagem of both governments is spun around as "facing insurgency" over which they profess fraternity. Burmese political leader and now the de facto leader of Burma has disgraced the Nobel Institute by wholeheartedly adhering to the policies of the country's military and continuing to support the genocide against Rohingya minority.